Shared flats (or shared apartments) are the most economic and suitable option for young people or students who want to be independent during their stay in Madrid. Flats for rent contain between 3 to 5 bedrooms. 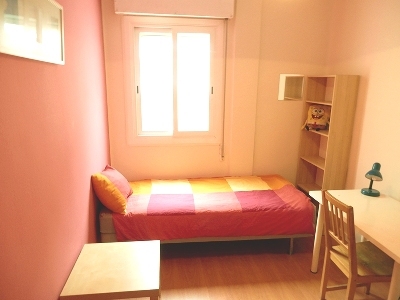 Most rooms are single with double rooms available for those coming to Madrid with a friend. Flatmates share access to the communal areas (living room, kitchen and bathroom). Total freedom to enter and leave as you wish. A welcoming young international environment, where you can meet likeminded people and discover Madrid together. You are able to cook your own food according to your preferences. You have a free access to Internet. You may be sharing the flat with between 3 to 5 people. The age range of the people you live with may be varied and people may work or study different hours to you. This difference creates a more cosmopolitan feel to the place and is highly recommended for those who want to discover all that Madrid has to offer. What can you expect from our rooms for rent? We select flats located in the best areas of Madrid: in the centre and in more low key areas, safe and well served by both the central bus service and the metro. They are fully furnished and equipped for the comfort of the residents. We regularly inspect our flats to ensure the ifacilities are in good condition and kept clean and tidy. We are in touch with the residents to ensure any issues which arise are resolved promptly and efficiently. We recommend a flat share if you are independent, and enjoy being able to cook for yourself. Note : there is an additional cost of 105€ per week for a private bathroom. Subject to availability.